The Hanoi summit is under a week away, Daily NK recently put out new market price data, and I’ve finally had time to update my dataset. There seems like no better time than the present to take a look at some of the numbers we have available for the North Korean economy, thanks to outlets such as Daily NK and Asia Press/Rimjingang. Let’s start with the exchange rate. A few weeks ago, the (North Korean) won depreciated quite significantly against the USD, which I wrote about here. At 8,500 won/1usd, the USD-exchange rate on the markets hit its highest point since the inception of “maximum pressure”. The graph below is shows the average market exchange rate in three North Korean cities for won-to-USD. Graph 1. Average won-USD exchange rate on markets in three North Korean cities, spring of 2017–February 2019. Data source: Daily NK. As the graph shows, the won rebounded somewhat after the initial spike in early January. According to the latest data point, the exchange rate stands at 8190 won, still somewhat higher than the average for the period, 8136, but barely. What could have caused this spike? One possibility is that the government has started to soak up more foreign currency from the market, because the state’s foreign currency coffers are waning. After all, given the vast trade deficit, the continued necessity of spending hard currency on things like fuel (bought at higher prices through illicit channels to a greater extent) and other factors, it would make a great deal of sense. Currencies fluctuate all over the globe, sometimes based even on loose rumors that fuel expectations. One anonymous reader who often travels to North Korea for work heard from Korean colleagues that accounting conditions for firms had gotten stricter, likely because the government wants to be able to source more foreign currency from the general public. It is also noteworthy that while the Daily NK price index reports that the USD-exchange rate has gone back to more normal levels, the Rimjingang index remains at very high levels. Its latest report (February 8th) has the USD at 8,500, and on January 10th, it registered 8,743 won, a remarkably high figure that the Daily NK index hasn’t been near since early 2015. The difference between the two may simple come from the figures being sourced from different regions, or the like. North Korea’s markets still hold a great deal of opportunity for arbitrage, not least because of the country’s poor infrastructure. So, it does seem like there may be some unusual pressure on the won against the dollar. What it comes from is less clear, but the state demanding more hard currency from the semi-private sector and others may be one important factor. In any case, we shouldn’t be surprised if the trend continues, unless sanctions ease soon. At the same time, while the RMB has appreciated against the won over the past few weeks, it hasn’t really gone outside the span of what’s been normal over the past few years. Graph 2. 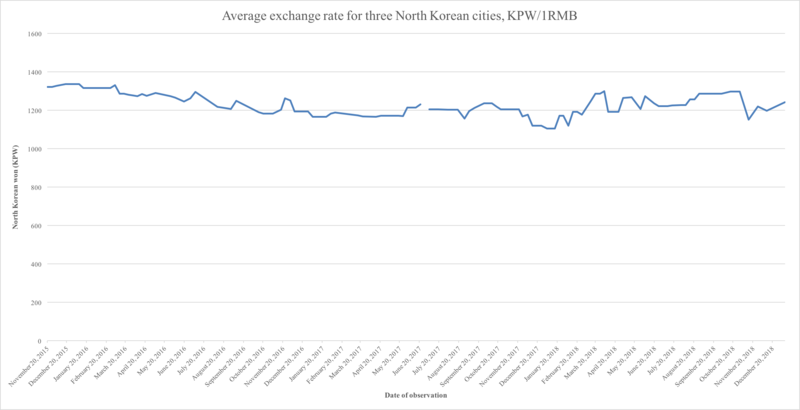 Average exchange rate for won to RMB, average of three North Korean cities, late 2015–early 2019. Data source: Daily NK. The average exchange rate for RMB since the start of Daily NK’s data series in late 2015 is 1228 won. The latest available observation gives 1241 won/RMB, and the RMB has appreciated against the won over the past few weeks. The Rimjingang data, here, too, gives a higher FX-rate for RMB than Daily NK, at 1250 won. Their index, too, shows the FX-rate for RMB going up over the past few weeks, but not to levels out of the ordinary. Still, if the won continues to depreciate against both the dollar and the RMB, it may be a sign of a more persistent foreign currency shortage. Rice prices remain as stabile as ever, in fact, even more so than this time last year. They continue to hoover between 4,500–5,000, with the latest observation being at 4,783. Graph 3. Average rice price for three North Korean cities, spring of 2017–early 2019. Data source: Daily NK. This should not necessarily be taken to mean that North Korea’s current food situation is not problematic. Even with increasing harvests in the past few years, it’s always been fragile. The past year’s drought reportedly took a toll on the harvest. Though market prices aren’t suggestive of any shortages as of yet, that could change in the months ahead. 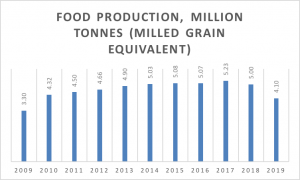 The latest harvest was likely lower than those of several previous years and difficulties in importing fertilizer may have contributed, but the dry weather was the main factor. 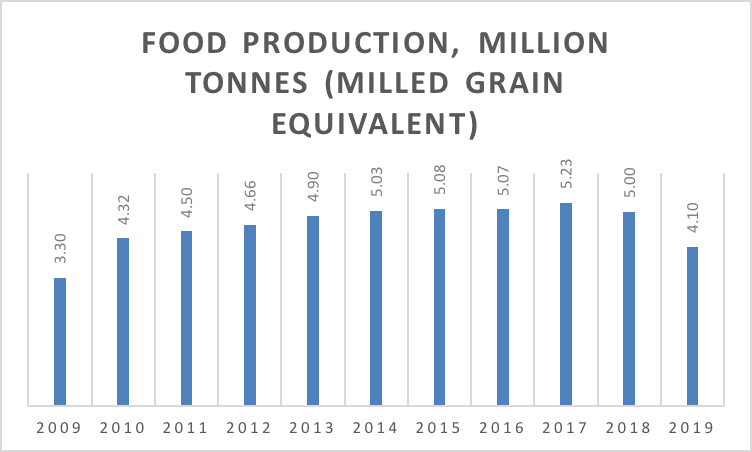 Even with a slightly lower harvest than in previous years, it seems that structural changes in agricultural management has improved agricultural productivity to such an extent that food safety isn’t severely threatened even with a reduced harvest. Gas prices appear to have stabilized around a sanctions equilibrium, of sorts, since a few months back. The past year hasn’t seen any spikes near those of the winter in 2017, when prices went above 25,000 won per kg. For the past year, the price has mostly hovered between 13,000 and 15,000 won per kg. The last observation available from Daily NK, is at 15,200 won per kg. This is slightly higher than the average of the past 12-month period, 13,500 won per kg. A more recent report from Rimjingang puts prices at 13,750 won per kg, so perhaps prices have declined over the past few weeks. Graph 4. Average gasoline price, three North Korean cities, early 2018–winter 2019. Data source: Daily NK. 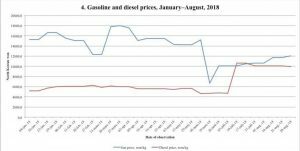 There is lots to be said about gas prices and their impact on the economy, but for now, it looks like supply of gasoline in North Korea is restricted, but stabile. I unfortunately don’t have any data to present on this issue, but it’s too important not to mention. We don’t know how large North Korea’s foreign currency reserves are, but all throughout “maximum pressure”, people have been speculating that they’ll soon run out. One South Korean lawmaker said in early 2018 that by October that year, North Korea would be out of hard currency. That clearly didn’t happen. The lack of stabile foreign currency income may still be a problem for the regime, as mentioned above. It’s hard to imagine how it couldn’t be a huge headache. Look at the following graph for example, showing North Korea’s trade (im)balance with China, throughout 2017 and the first few months of 2018. Graph 5. North Korea’s trade balance with China, in $1,000 terms. Data source: KITA. Let’s assume that China is simply letting North Korea run a trade deficit, with only some vague future promise of payment in the form of cheap contracts for coal and minerals. Or, let’s say that China is even just sending North Korea a bunch of stuff without requiring any form of payment whatsoever. It seems highly unlikely to me that even a government like China would support the full extent of these imports. Even if North Korea is only paying in hard currency for a relatively small proportion of what it imports from China, that’s still a lot of money that’s just leaving the vaults, with virtually nothing coming in to replenish them. How long can this go on for? Probably longer than many estimated at the onset of “maximum pressure”, but certainly not forever. In sum, judging by the numbers, North Korea’s domestic economic conditions appear stabile but quite difficult. No sense of widespread, general crisis is visible in the data. Nonetheless, the regime is likely under a great deal of stress concerning the economy. How much is hard to tell, but definitely enough for some form of sanctions relief and/or economic cooperation to be high on their agenda for Hanoi. According to a South Korean government source closely acquainted with the North Korea-US talks, Kim reaffirmed the North’s willingness to dismantle its Yongbyon nuclear facilities during the first round of working-level talks in Pyongyang on Feb. 6–8, while demanding the partial loosening of sanctions as a corresponding measure for allowing inspections of the facilities. The North Korean side said it “could offer more generous steps” if the US were to even partially loosen sanctions as a corresponding measure, the source reported. And not least, any sanctions exemptions on Mt Kumgang and the like could – hopefully, from the regime’s point of view – be a first step to more South Korean investments and cash flows to tourism in North Korea, one of Kim Jong-un’s hallmark industries. Accordingly, they suggested that if North Korea adopts a more forward-thinking approach on the Yongbyon dismantlement issue during negotiations, the US may grant priority consideration to projects involving inter-Korean cooperation, including partial resumption of the Kaesong Complex and Mt. Kumgang tourism. This prediction was based on the limited range of measures available to the US without touching the current sanctions framework. Indeed, many Korean Peninsula experts have noted that the Mt. Kumgang tourism venture individually would not be in violation of UNSC resolutions and suggested that it should be quickly resumed. I’m no judicial sanctions expert, but I suspect that this might not be entirely accurate. If sanctions are strenuous enough to prevent South Korean reporters to bring in laptops into North Korea, it’s easy to wonder how large-ish-scale tourism to North Korea through Kumgangsan wouldn’t risk violating sanctions. In a way, the multilateral UN sanctions are easier to loosen in practice. A strong, even informal signal from the US to China could make the latter re-interpret its sanctions interpretations, and make monitoring and enforcement much more loose. Truck traffic has reportedly already increased across the border compared to a few months ago, and it’s a trend that’ll likely become increasingly more pronounced the less vigilant the US is about pushing for rigid sanctions implementation. A while back, I speculated that fuel prices in North Korea might go down after Kim Jong-un’s visit to China. This is precisely what happened, Daily NK reports. 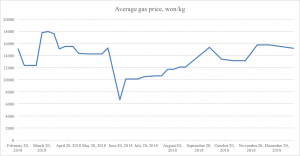 Causality is of course impossible to prove, but given circumstances (and the historical pattern of fuel price movements, which I write about in a forthcoming working paper), a connection doesn’t seem unlikely. Also, see this on the general ease of smuggling conditions/border controls after the visit. The claim is based on information provided by two unnamed member states, though one has been identified as Japan, according to officials in Tokyo. It is also expected to be reported that more than 15 Chinese fishing vessels were inspected and found to be carrying licenses from North Korea, officially known as the Democratic People’s Republic of Korea, during the reporting period of January-November 2018. It is anticipated that information obtained from fishermen who were questioned will reveal that around 200 Chinese fishing vessels were operating in North Korean waters. Based on another interview, it was discovered that the price of a single fishing license cost about 50,000 yuan ($7,250) per month. The fishing vessels apparently displayed fishing permit number plates that were attached to the outside of the vessels, flown on flags, or both in combination. These actions violate a Security Council resolution adopted in December 2017 in response to Pyongyang’s ballistic missile launch the previous month. In it, the 15-member council clarified that any sale of fishing rights by North Korea was strictly prohibited. Last September, Japan’s Foreign Minister Taro Kono highlighted concerns about the sale of fishing rights as well as ship-to-ship transfers of petroleum products as two examples of the North’s “sophisticated efforts to evade and circumvent” past resolutions. The resolutions were imposed on the country in escalating fashion as it carried out a total of six underground nuclear tests and numerous missile launches using banned equipment. Each year, the panel prepares its report based on information analyzed by its eight members, who have expertise on a variety of issues such as nuclear nonproliferation and export trade control. Could Xi Jinping give Kim Jong-un fuel deliveries for his 35th birthday? At the present time of writing, Kim Jong-un is still in China, though some signs suggest his train may have taken off back to North Korea. Kim spent is 35th birthday in Beijing, and visited a high-tech factory zone and other sites relevant to his economic and industrial policy focus. But what did Xi Jinping give Kim for his 35th birthday? 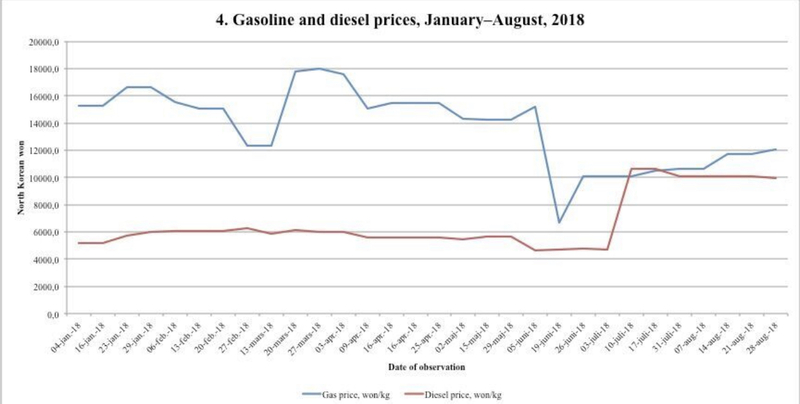 Average gasoline and diesel prices on markets in three North Korean cities, January–August 2018. Data source: Daily NK price index. Graph: Benjamin Katzeff Silberstein/North Korean Economy Watch. Look closely at the dip in the blue line, in the right-hand side of the graph. This shows a significant drop — 50 percent! — in average gas prices on markets in three North Korean cities. This price drop came right at the time of Kim’s third visit. Market prices, however, tend to move for a reason, and there are no obvious factors that can explain this particular price drop. Other than Kim’s visit, that is. This is, of course, circumstantial speculation, but it makes a great deal of sense. China may have simply upped fuel deliveries to North Korea as a show of good faith prior to Kim’s visit, or after a direct request from Kim. Should Kim have asked Xi for similar sanctions relief during this visit, it wouldn’t be all that surprising. It’s also worth noting that exchange rate for both US dollars and Chinese renminbi have gone up quite significantly on North Korea’s markets in the past few weeks, as I noted a couple of days ago, hinting that the economy may be under some distress. North Korea may not be under any general economic crisis as a result of the sanctions, but things surely aren’t looking great. We should know when the next price update from Daily NK or other sources comes in, and just because Kim seems to have gotten sanctions relief at one point after a meeting with Xi doesn’t mean it’s a given for every single occasion. But it is reasonable to expect that Kim did get something from the trip. It did, after all, coincide with his birthday. Judging by the latest market price data from Daily NK, the exchange rate of the North Korean won (KPW) to the US dollar (USD) appears to have reached its highest point since the beginning of the latest period of heightened tensions with the United States. The latest price observation by the Daily NK puts the KPW-USD average exchange rate on markets in three North Korean cities at 8,500 won. That’s an increase of 445 won from the last observation (December 11th), or about 5 percent in a fairly short time span. (Please click both graphs for closer views). Graph 1. 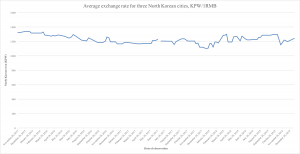 KPW-USD average exchange rate for markets in three North Korean cities, January 2017–December 2018. Data source: Daily NK. The Chinese Renminbi (RMB) has also appreciated against the won in the latest observation, but not by as much. From the observation on December 11th, the RMB went up from 1197 KPW to 1242, an increase by about 3.7 percent. Graph 2. KPW-RMB average exchange rate for markets in three North Korean cities, January 2017–December 2018. Data source: Daily NK. As graph 2 shows, the RMB-increase is almost as large as the one for USD. The RMB, however, is not at an historical high for the period in question, which the USD is. The RMB is, on the other hand, significantly higher than in the same period last year, and from December 26th of 2017, it’s increased by almost 11 percent, from 1120 KPW to 1241. The USD, meanwhile, stands at about 6 percent more than it did on December 26th of 2017. In other words, both currencies have appreciated, and by significant proportions, assuming that this latest price report conveys accurate information representatives of the general exchange rate level in the country. It doesn’t seem to be a seasonal issue, given the differences from last year. With the information currently available, it is of course very difficult to tell what could have caused this minor spike of sorts. The two currencies are likely not controlled by the exact same factors, as the RMB is much more widely used among the North Korean public. Few people hold and use USD on a daily basis. Rather, the main holders of USD in North Korea are likely to be state institutions such as major state-owned enterprises. This matters for the way the markets are likely to work for RMB and USD respectively. Both, on the other hand, are foreign currency. As such, they are at least partially interchangeable. To put it simply, if the regime would decide to soak up foreign currency in general, for whatever purpose, it would likely target both USD and RMB, and other foreign currencies as well, because they can be used for the same things to a large extent. So. What could (and I say could with the utmost of caution) have caused this upturn? The regime has been conducting market crackdowns on illegal trade and smuggling of banned foreign goods, such as foreign media, over the past few months. An upturn in this crackdown could cause anxiety on the markets, causing people to hoard foreign currency. It doesn’t seem, however, that foreign currency trade has been targeted in particular, making this scenario unlikely. It could also be that other goods that require foreign currency payments, such as gasoline, have become more expensive. This means that traders buying and selling such goods need more foreign currency to pay for their imports, and they may even require foreign currency payments from their customers. This, in turn, would cause the RMB and possibly the USD to appreciate over the KPW. 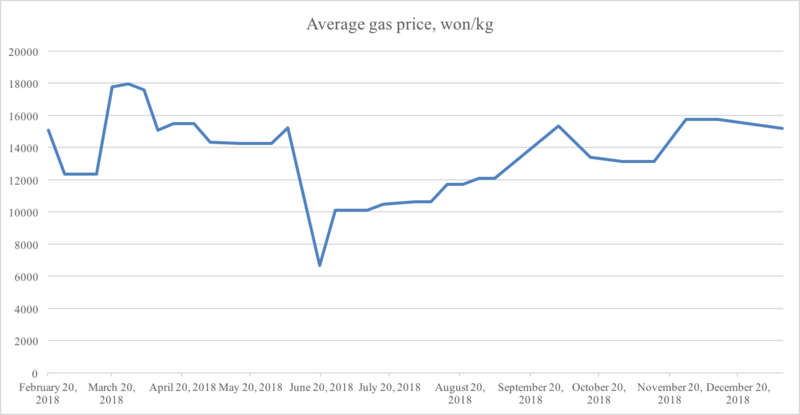 But gas prices aren’t out of their ordinary span, and they’ve actually decreased in the latest price observation, to 15,200 won/kg from 15,200 won/kg, albeit after first spiking from 13,133 won/kg to 15,733 won/kg between mid- and late-November. Still, the trends don’t run in parallel. A third possibility, and the most likely one out of the three presented here, in my opinion, is that the state has soaked up foreign currency from the markets by, for example, demanding more of it from state-owned enterprises. It could also be that if in normal times – and this is a big if – the state releases foreign currency on to the markets to maintain exchange rate stability, they’re doing less of that now, causing the foreign exchange rate to appreciate. The state’s foreign currency reserves and coffers have likely been dwindling for some time under sanctions. Curiously, we haven’t seen signs of it on the markets. It will be interesting to see whether the trend continues in the weeks and months ahead. China, North Korea’s longtime ally, has provided technology and expertise for the coal-conversion efforts, according to Chinese companies. One said in July that it is supplying a large coal gasifier designed to produce 40,000 cubic meters an hour of synthetic gas to an industrial zone north of Pyongyang. That output alone would be enough to produce synthetic fuels equivalent to about 10% of North Korea’s annual imports of crude and refined oil in recent years, according to David Von Hippel, an expert on North Korea’s energy sector at the Nautilus Institute. It has become cheaper in recent years—in part because of Chinese development of the technology—and remains viable for countries with abundant coal and few alternatives. North Korea obtained German coal-gasification technology from the Soviets around the 1960s but did little to develop it, and became dependent on subsidized crude from Russia and China. Crucially, coal gasification has helped provide raw materials to increase output of fertilizer and plastic sheeting for greenhouses, boosting food production, and enabled other industries to develop products such as steel alloys and pipes, experts said. The technology is also now used in small-scale power plants to boost electricity supplies, according to footage broadcast by North Korean state television in November. One Chinese company, Hebei Kaiyue Group, said on its website that seven officials from North Korea’s Academy of Sciences visited one of its facilities in June to study how it converts coal to methanol, ammonia and dimethyl ether, which can be used as a diesel alternative. The large gasifier slated for the industrial zone north of Pyongyang was built by Yangmei Chemical Industry Machinery Co. Ltd, a subsidiary of one of China’s biggest coal companies; it has been completed but not yet transported to North Korea, as the Chinese awaited North Korean instructions, according to two people involved. The company declined to comment. I have a brief quote in the story, basically saying that even if North Korea can only produce fairly moderate quantities of gasified, synthetic fuels through this technique, it could potentially be very significant for the economy as a whole. This is particularly true for transportation and industrial manufacturing. The former is crucial not only for the state-side of the economy, but also for the private sector (i.e. : markets and entrepreneurs). When trying to asses whether North Korea can “weather” sanctions or not, it’s meaningful to remember that the economy as such is still, partially, recovering from the near-complete collapse of the 1990s. So the quantities needed to make a significant contribution to industrial production may not be that massive. All of this is a way of getting at, in absence of actual numbers, how much this coal gasification technique may matter for North Korea. Putting together whatever oil and fuel North Korea can get through smuggling, regular imports, non-commercial transfers from China, and coal gasification, North Korea is probably muddling through sanctions relatively well, and better than many would have expected a year or so ago, at least in some respects. Is China enforcing UN sanctions on North Korea? Is “maximum pressure” still on and working? How much is China really trading with North Korea? None of these questions can really be answered with the open-source information available at the moment. In fact, I doubt that any sources exist that could provide a conclusive answer. Much of the relaxation in Chinese implementation of the various bans and limitations on trade with North Korea likely comes from the Chinese authorities simply turning a blind eye, and how do you record trade that happens because you’re looking away? The best information we have, unsatisfactory as it may be, comes from anecdotal observations along the border between China and North Korea. Nikkei Asian Review recently visited the border area and gives us an interesting and informative look at what the situation is like in the region. However, the information given through reports such as this one is not enough to jump to the conclusion that China has stopped enforcing sanctions on North Korea. As I explain further below, until we see significant, meaningful amounts of coal and textiles crossing the bridge, North Korea is still suffering immense losses in its export incomes from Chinese implementation of sanctions. The number of trucks making their way across the Sino-Korean Friendship Bridge increased sharply in November, according to an executive of a housing materials supplier in the border city of Dandong. Many carry plywood flooring, elevator components and other materials to construction projects in North Korea, while seafood heads in the other direction. I saw similar goods transported over in great quantities in the summer of 2016, another point in time when China was supposed to be squeezing North Korea economically, according to the sanctions frameworks in place. “These days, the bridge gets jammed with traffic, which is something we rarely saw after the sanctions resolution” in 2017, the executive said. This is a similar impression to what we’ve seen in other news reports. Traffic declined drastically during the US-North Korea tensions of 2017, and the during the late summer and fall of that year in particular, when round after round of sanctions were levied on the country. However, that traffic has increased from a relatively extreme low point is itself not evidence that sanctions no longer have any effect. Traffic alone does matter as an indication, but not much more. We need to know what is being shipped as well. Increased bilateral trade serves both countries’ aims. Beijing wants to strengthen its influence over Pyongyang, while the Kim Jong Un regime needs to develop a struggling economy. Activity at the border area highlights attempts to rebuild ties. About 70% of China-North Korea trade passes through Dandong. In late November, construction work could be seen getting underway in Sinuiju on the other side of the Yalu River, which separates the two countries. A large, cylinder-shaped building is taking shape close to the bridge, in an area that also hosts an amusement park. According to local rumors, it is a hotel that will target Chinese tourists. About 10 km to the south lies the New Yalu River Bridge, which is expected to replace the older crossing as the main cross-border artery when it opens. Many structures that look like new apartment buildings can be seen close to it on the Korean side. The North Korean leader has shifted his focus to economic policy amid improving relations with China and South Korea. Sinuiju will potentially be crucial to driving economic growth through trade with China. This past summer, Kim inspected cosmetics and textile plants in the city, and many believe Pyongyang has stepped up the development of nearby areas. And just a few weeks ago, Kim Jong-un oversaw the Sinuiju grand redevelopment plan. The sanctions imposed on the Kim regime over its nuclear and missile programs make it difficult for the country to rebuild its economy on its own. China, which accounts for 90% of North Korea’s total trade in value terms, is backing efforts to revitalize the city. Black North Korean clams are easily distinguished from the yellow Chinese variety, claimed a middle-aged woman at the Donggang Yellow Sea market as she hooked some out of a net and sorted them by size. The Chinese authorities toughened controls on imports of clams, crabs and other seafood from North Korea immediately after the sanctions were imposed, but several wholesalers said smuggling in the Yellow Sea had picked up again this past spring. North Korean seafood at the market, they claimed, was simply being packaged as if it came from China. The clams served at a restaurant in the city were all black. The sanctions also restrict the acceptance of North Korean workers. At a garment factory in suburban Dandong, however, there were a number of female laborers from across the border, and what appeared to be a North Korean merchant was seen staying at a luxury hotel in the area, neither of which would have been common sights just after the sanctions were imposed. These people most likely enter China on short-stay permits, rather than working visas. Guest workers appear to have been one of the first areas in which China began relaxing control, shortly after Kim Jong-un’s spring 2018 visit to Beijing. Chinese influence in North Korea’s construction sector also appears to extend well beyond the supply of materials. “It is hard to imagine they have the technology to construct a round building,” said a senior official of a construction materials company in Dandong, speaking about the supposed new hotel on the other side. What is less hard to imagine, he assumed, is where the technical support was coming from. Locals claim that a Chinese inspection team had gone over to look at the construction of roads linking the new bridge with the nearby town. Again, all of this matters. 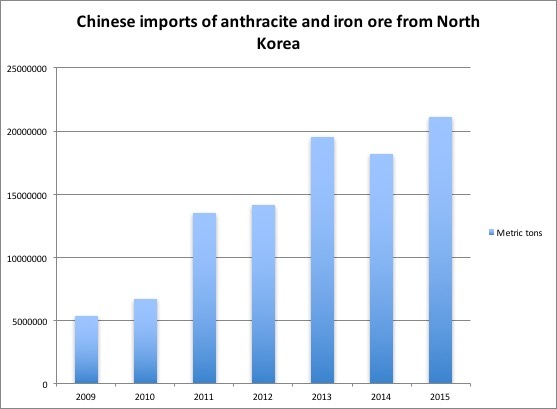 But the question is just how much it matters when North Korean can’t export nearly the same quantities of coal and minerals to China that it has over the past few years. Some might argue that this trade, too, could simply be hidden and kept off of China’s books. I doubt it. Some, perhaps, but absolutely not all or even most of it, simply given the quantities we’re talking about here. I would think you’d have to do quite a few nighttime runs by ship across the Yalu river to get any meaningful quantities across hidden. Consider the mere magnitude of the numbers we’re talking about here. I unfortunately don’t have time to dig up the latest data right now, but for a sense of proportion: in July of 2017, China imported only 2.7 million tonnes of coal from North Korea, a downturn of 75 percent. To my knowledge, this number hasn’t climbed significantly since, aside from some outlier months before various sanctions have taken effect, and the like. Chinese imports of North Korean coal account for 42.3 percent of total Chinese imports, according to one figure. The point isn’t that North Korea is under perfectly applied “maximum pressure” by China. But that trade may be somewhat more porous than a year and a half ago doesn’t mean that North Korea’s economy isn’t experiencing immense difficulties under sanctions at the present moment. I’ll finish this post with a graph showing total volumes of North Korean exports of anthracite and iron ore to China between 2009 and 2015, a period of immense growth in these exports, based on UN Comtrade data. These incomes have been crucial for Kim Jong-un’s ability to orchestrate the massive infrastructure updates and construction projects we’ve seen under his tenure.